On August 6th, Governor Patrick signed into law legislation amending the CORI Act that affects employers’ use of criminal history of potential and current employees. This law dictates the means in which employers and other interested parties can access Massachusetts criminal records as well as the procedures that they must follow to obtain and rely on this information. Massachusetts Fair Employment Practice Law that allowed questions about felony convictions and misdemeanor convictions, not protected from disclosure, is now amended to prohibit employers from asking questions on an “initial, written application form” about an applicant’s “criminal offender record information.” This includes criminal charges, arrests, and incarceration. · Have you ever been convicted of a felony? · Have you ever been convicted of a misdemeanor within the past 5 years (for offenses other than drunkenness, simple assault, speeding, minor traffic violations, affray, or disturbing the peace)? Thus far, since “initial written application” term is used, it is being construed that employers can continue to question applicants about felony and currently unprotected misdemeanor convictions in subsequent parts of the application process such as in-person interviews. The records will no longer include (1) felony convictions that have been closed for 10 or more years (2) misdemeanor convictions closed for more than 5 years. Also, individuals can obtain from the Dept. of Criminal Justice Information Services a log of all persons who requested his/her CORI record, the date of request, and certified purpose of request. 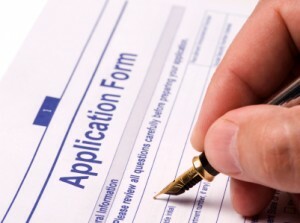 1) Have the applicant sign an acknowledgement form authorizing employer to obtain. 2) Employer must verify applicant’s identity by reviewing government issued identification. An employer must provide a copy of an individual’s CORI record to him/her before they ask any questions regarding his/her criminal record, decide not to hire, or take adverse actions based on information in the record. Employers must retain signed authorization forms for criminal record checks for at least one year from date check conducted. Employers are prohibited from disseminating the record to anyone other than those within employment with a need to know, certain government officials, or as requested by the person as subject of the report. Employers must destroy record checks within 7 years after the employee’s last date of employment or the date the decision made to not hire applicant. Employers are shielded from liability for failure to hire based on erroneous information on applicant’s CORI record. They also cannot be liable for negligent hiring due to relying solely on CORI records and not performing additional criminal history background checks prior to hiring an individual. · It may require employers to obtain criminal offender information solely from the Department of Criminal Justice Information Services – a newly created dept. It is recommended that employers proceed cautiously until the above intents are made clear.